I’ve been working on a book chapter about Jeremiah 17:5-8, in which Jeremiah compares a cursed man to a bush in the desert who will live “in a land of salt without inhabitant” (v. 6). Well, I had never heard of a land of salt and really couldn’t picture what that might look like, and so I googled the phrase just to see what would come up. The Bonneville Salt Flats just outside of Salt Lake City, Utah, showed up in the list of hits. If you read through the Google hits for the Bonneville Salt Flats, you’ll see words like “nothing for miles,” “desolate,” and “barren.” Famous races happen there, by car and on foot, but – and this is mainly for my sweet husband – please don’t feel like you have to go run the 100-mile race there … ever. (Even if you could leave your salt tablets at home and still be okay.) Despite the attraction for speed junkies, there’s a whole lot of nothing to this desert land. Now, even if you have never been to such a desolate place, you probably know or can guess how the human mind reacts to nothingness, to vast desert stretches, to a land of salt with no inhabitants. As artist Karl Momen drove through the salt flats, his mind filled with a vision of a tree – perhaps out of a desperate need to see something, anything, growing and green out in the salt flats. Momen created an 87′ tall sculpture along Highway 80, called “The Tree of Utah (Metaphor).” (Here’s a fun blog with photos of the sculpture, and the blogger has been so inspired by it that she’s knitting socks to resemble the sculpture.) Other bloggers have less kind things to say about the sculpture. Yep – you know me. I can stumble across a tree anywhere, even in the middle of research about miles of nothingness. As I looked through the images for this sculpture, I thought about art imitating life. I don’t particularly like Momen’s sculpture, though I do understand the urge to fill up nothingness with something. But his sculpture definitely attempts to suggest flourishing life in the most unlikely of terrains. 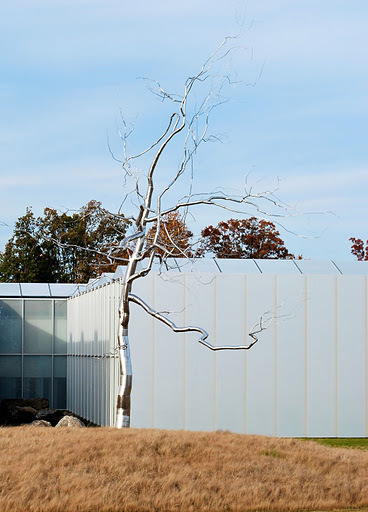 Near the main sculpture, Momen added pods of concrete, as if the tree has flowered and shed seed pods or leaves. Like them or hate them, both sculptures are art and, in their own ways, attempt to imitate some aspect of living or dying. I guess I simply prefer a different sort of art imitating life. So tell me, which of the two sculptures do you prefer? It’s pouring a cold rain where I am today, and so it’s hard to consider heat and drought, but fear and anxiety can be with us in any season of the year. So join me here next week, as I talk about this tree planted by the water … and how we can cling to the promise of its yield. This entry was posted in flourishing tree and tagged art, Jeremiah, trees by hopesquires. Bookmark the permalink.